Cat Ba Island is an oasis where you can be apart for one or a few days during a long voyage. 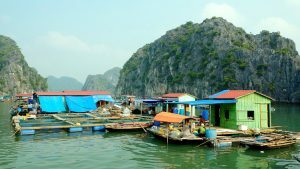 If starting from Halong Wharf it will take you 4 hours by a tourist boat, with stopovers for swimming, visiting spectacular karsts and having fresh sea food. In a single word, you can contemplate the beautiful scenery of Halong before reaching the island. You can also buy a ticket of the hydrofoil departing from Hai Phong Seaport to reach Cat Ba Island if your itinerary saves Halong for another visit. With an area of 356 square km wide, Cat Ba Island encompasses forested zones, coastal mangrove and freshwater swamps, beaches, caves, and waterfalls. In 1986, the Northeast side of the island was designated a National Park, including a protected marine zone. Cat Ba Island supports a population of over 20,000, most of whom live off fishing or farming in the South, in and around Cat Ba Town. The town is small and ancient, with clusters of fishing boats and inspiring sunsets across the harbor. 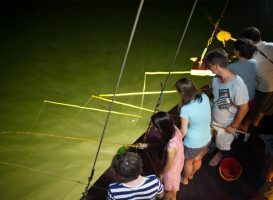 You can check out the catch of the day in the early morning , see cuttlefish dried over hot charcoals, or stroll around the old town. It’s a short hike from Cat Ba town through a tunnel to Cat Co Beach, whose mountains look like a throne holding a marvelous sandy coast, or if you hike further along, you will reach the rockier Cat Vang Beach . 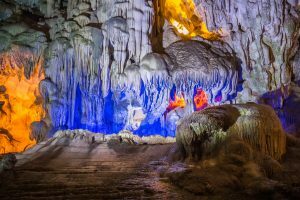 As transportation o­n the town is not so well-developed, motorbikes is the most helpful means to get you to the larger Trung Trang Cave with many chambers, or to the National Park, or to discover other beaches around the island. A tour guide is necessary to help you communicate with the local drivers and introduce these viewpoints. The national park contains stringy trees, thick undergrowth and slippery vines. There is a great view that includes a French, now Vietnamese, farming village from the top of the mountain and a lake in the middle of the park that takes a half day to reach.